My talk at the first meeting of the IIBA in Nottingham last week went well - don’t just take my word for it Alex Papworth says so too. 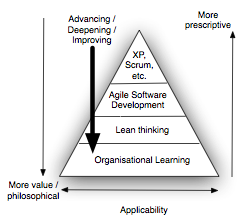 As I mentioned last time, I recently delivered a course on Lean software development in Oslo. One of the exercises I set people was to produce an A3 report. A3 reports, for those unfamiliar with them are a mechanism used at Toyota to analyse issues and suggest solutions, or rather “counter measures” . The term “counter measures” is preferred over solution because no “solution” is ever the end of the story. One day there will be a better solution, er, I mean better counter measure. A3 training: An important part of A3 writing is to “go and see” the actual work happening, and talk to the actual people who do it. In a classroom you can’t actually go and see the issue, you can’t talk to the people performing the task or check the company data. Therefore I allowed students to make assumptions as long as they noted them on the report. Afterwards we could talk about how the assumptions could be validated to prove, or disprove them. A3 report: this is the same report template without the extra space for assumptions and notes. This is the template to use for real outside the classroom. Strictly speaking there isn’t a specified A3 format. This confused me when I first started digging into the A3 method: I was looking for templates. It turns out that you can just start with an blank sheet of A3 paper, but it also seems there are some standard elements and structures people use when writing an A3. My templates are what I think are the key elements. But the actual A3 report, the thing you can see is only half the story. The A3 report is not just a thing, it is a process. The process of creating the report, the observation, investigation and mentoring, is probably more important than the end result. If you want to know more about A3 reports John Shook’s book “Managing to Learn” is good, although you have to order it from the Lean Enterprise Institute, its not at your local online bookshop. For a shorter version check out Shook’s article in the MIT Sloan Management review, “Toyota’s Secret: The A3 report”. One thing that struct me while reading Shook’s description of A3 is their similarity to patterns: both involve a context, a problem, the things that make the problem hard (forces or analysis), both propose a better way (solution or counter measures), both value brevity and both allow the authors to change the format to suit the problem. More importantly, a key element of A3 reports is the mentoring of A3 writers that occurs during the creation process. This sounds just like the shepherding process that any pattern paper being present at a conference goes through. Having shepherded many pattern papers - and won a couple of awards for it, I might say - the A3 mentoring process seems exactly the same. Back in the Oslo classroom I learned: allow plenty of time for the A3 report writing. Its not something to be rushed. I recently experimented with A3 formats on a coaching assignment with a client. I asked several manager to complete one. Most of the time, if you are going to ask someone to do an A3 you need some position of respect, or at least authority. They look odd to manager schooled in long report and PowerPoint reports, they require a depth of thinking they are not accustomed to and they look funny. If anyone tries using these reports please let me know what you think and what your results are. And if anyone wants to do an A3 with me, I will be running the Lean course again in Oslo in November. This course was two days, I’m planning to increase it to three days next time so allow more time for this and other exercises. This link has been in my blog backlog for a couple of months, waiting to work its way into a blog post. But I’m fed up waiting so here it is raw. Originally published in 1992, before Java, before C#, before Agile, when Lean was just breaking out of Toyota and before the web (almost) this is a classic piece about software design. Reeves argues that all coding is design. His specifics might refer to C++ but this could be any language. Just in case you are in any doubt: I completely agree. There is a £10 charge but you do get buffet, I’m told places are limited and there are quite a few bookings aleady. The talk is entitled “The Falling off a Log theory and other observations on the software industry”. Think of it as the road-show version of Falling off a Log. I like magnetic white boards best myself but I’ve seen teams use walls, cupboards and flip charts too. The important points are: big, visible things you can stick other-things on it. I prefer to use index cards but many teams use Post-It type stickies. If you use index cards you need a means of sticking them to the board which is where the magnets come in. You can divide the columns: classically this is To do, In Progress and Done. Of course Kanban teams use many more columns. At first I used the same dry market pens to mark the columns as to make notes on the board. The trouble is these lines tend to disappear. This is a particular problem with Kanban teams who have more columns and so more movements to make. So now I use coloured electrical insulation tape to mark the columns. This is much easier to see and lasts a lot longer. Leave space on the board to include Team or Project name and the end date of the iteration. You might also find space to keep a burn-down/up or cumulative flow diagram. You don’t need a very big board: I normally use 120cm x 90cm, again Kanban teams tend to need bigger boards because they have more columns. You can buy a suitable board from most stationary suppliers for less than £100. If your company can’t afford this (or won’t pay) you have problems which Agile isn’t going to fix. Remember to buy magnets, dry wipe pens and something to remove the permanent market someone is going to put on there eventually. Boards are usually mounted on the wall or a stand but, I prefer them to be free standing because you can carry them around. If you have a meeting in another room you just pick the board up and carry it there. And its a team exercise to move it. We had an accident with a board once: it was hit from behind at the start of the planning meeting and everything came off. But that turned out to be good, we looked at everything in more detail. Sometimes I now remove everything at the start or during the course of the planning meeting and only replace it if I need to. Don’t put designed on your board: there isn’t enough space. By all means have another board for designs.